More than by war and religious and political upheavals, the experience of life in the modern age has been radically changed by industrialization. The intrusion of machines into the world of man, the increasing dominance of machines in industrial processes are already reflected in paintings and the literature of the nineteenth century. However, in music – the most romantic of all the arts – a consideration of the social as well as the material and intellectual implications of this change took place only much later, after the First World War. In the 1920s – that "marvelously masculine epoch", as the machine fetishist Fernand Léger referred to them – the mechanical era found its way with vehemence into the concert and opera houses. An opera like Machinist Hopkins by Schreker-pupil Max Brand took the opera houses by storm at the end of the 1920s and boasted performance statistics equaled only by Krenek's Johnny spielt auf (Johnny Strikes Up); Honegger's locomotive piece Pacific 231 (1923) and Alexander Mossolov's The Iron Foundry (1926-28) caused sensations around the world. George Antheil's Ballet mécanique (1924) is considered the high point of the musical occupation with the world of the machines. The exploration of the possibilities of the quasi-mechanical organization of musical parameters (ostinato repetition and a block-like stringing together of rhythmically dominated elements), which Antheil tried out in his previous piano and chamber music works of the early 1920s, were realized in it on a large scale. With the use of propeller sounds and alarm bells, Antheil did his best to live up to his reputation as the iconoclastic "Bad Boy of Music": ten years after Stravinsky's Sacre, the musical world needed a new scandal. The topos of machine music exerted – also less ostensibly – a substantial influence on the generation of the post-Romantics to whose intellectual inventory it belonged, as did jazz, the archaic rhythms of Stravinsky's folkloristic works, atonality, and dodecophony. However, from a later point of view, the fascination of this generation of composers for the cold life of the machines often seems to be interpreted too one-sidedly and too positively from the perspective of Russian Futurism and Suprematism. The compilation of important works of the piano repertoire primarily from the first half of the twentieth century that is planned here therefore desires to direct attention to the extremely eclectic, often ambivalent attitude of the artists toward the pulse-setters of the new rhythm of life, as the machines were understood to be. Antheil's machine-inspired piano sonatas and chamber music works of the early 1920s were written under the impression of two dreams from 1922 in which the horrors of the machinery of destruction of the First World War were projected on to the apocalyptical scenery of a new, global twilight of mankind: "Vast amounts of dead and dying machines of some tremendous future war on a battlefield of a final cataclysmic struggle, ruined, overturned, blown to bits." 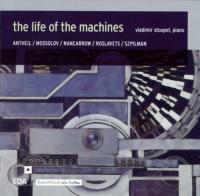 In contrast to this, Władysław Szpilman's piano suite The Life of the Machines: "In it, the musical transfer of that which perpetuates itself mechanically is not informed by power and threat; rather these are good-humoredly humming, cheeky, sometimes sardonic machines, like come-to-life clockwork mechanisms: they attain their own individual characteristic life, they interact." (Günter Herzfeld) The suite was composed in 1933 after Szpilman interrupted his piano studies with Artur Schnabel in Berlin as a result of the political situation, in the year of the National Socialist seizure of power with which the countdown began for the new world war foreseen by Antheil. For Szpilman, the brilliant pianist and composer of Jewish descent, it led into the purgatory of his fight for survival in the Warsaw ghetto – brilliantly and touchingly filmed by Roman Polanski in The Pianist. That what Antheil asserted about the modern piano literature after Chopin and Liszt – it "is essentially virtuoso, exploring the limits of the modern keyboard, as well as the limits of the composer's invention in the purely musical sense" – points directly to Conlon Nancarrow, the great and for many years unrecognized pioneer of mechanical piano music, who after being discovered in the 1970s had a lasting influence on America's and Europe's avant-garde. With his punchcard-controlled pianolas, he defied the "natural" borders of the living performer, and explored the field of pianistic illusionism with ultra-virtuoso, polyrhythmic, and polymetric cascades of sound. Few contemporary piano virtuosos have picked up Nancarrow's gauntlet, have measured their technique against the piano transcriptions of his works for pianola – and have thus provided the proof that, a century after Scriabin, Godowsky, Leschetitzki, Medtner, Hoffmann, and Paderewski, the Gradus ad Parnassum has yet to be surmounted. Mechanical pianos originally served only for the reproduction of actual piano music – with results that were far superior to the first acoustical recordings. It was therefore logical that important pianists (for example, Ferrucio Busoni, Josef Hofmann, and Sergei Rachmaninoff) recorded their playing on piano rolls (that were played back on mechanical pianos). For the American Conlon Nancarrow this resulted in the just as unconventional as revolutionary decision to exploit the mechanical piano as a novel medium of composition. With the aid of a special punching tool, he developed a process that allowed him to compose directly on to piano rolls (comparable to punching holes into the paper strips or cards used on older computers). In this manner, it was possible to realize textures with extremely fast tempos, unusual tonal density, and complex rhythms that went far beyond the customary playing techniques (of the piano). With his Studies for "player piano" (i.e., electronic and mechanical piano), he created a unique repertoire for this "instrument". Conlon Nancarrow was born on 27 October 1912 at Texarkana, Arkansas. In the 1930s he studied composition in Boston with Walter Piston, Roger Sessions, and Nicolas Slonimsky, consequently receiving a solid classical training. He subsequently sought to expand his artistic horizon in Europe, but then went, owing to his strong political convictions, to Spain as a soldier in the Abraham Lincoln Brigade, fighting there in the civil war on the side of the Republicans. After their defeat, he returned – wounded – to the USA. As a former Brigade member, however, he was faced there with considerable political repressions, which prompted him to emigrate to Mexico. Already in 1939, Henry Cowell called Nancarrow's attention to the possibilities of the player piano. In 1947 he purchased one and from then on dedicated himself to the composition of pieces for just this "instrument". In the European musical scene, one became aware of Nancarrow only in the 1980s, after recordings of his Studies became available. György Ligeti was particularly impressed by Nancarrow's music and made it possible for him undertake a series of concert tours during the last years of his life (with an original Ampico-Bösendorfer self-playing concert grand piano). Nancarrow died on 10 August 1997 in Mexico City. Nancarrow was by no means merely an experimenter and tinkerer. He possessed a thorough knowledge of composition, which is to be perceived in all his works. This is also true of the three-movement Sonatina (1941), a work originally conceived for player piano that he later reworked for "normal" piano, both in a two-hand as well as a four-hand version. The utmost is demanded of the performer, especially in the outer movements: difficult to realize canonic voice leading, asynchronous motion sequences, and breakneck leaps. It is no wonder that the composer, as we are told, preferred the rendition on the mechanical piano – consequently: an even greater challenge for a "real" pianist. The nervously forward-urging first movement (Presto) takes the tone C as its point of departure, around which clear-cut, concise tonal structures are formed. With that, a process of tonal densification is initiated which above all makes use of the high register. The high point is reached with forceful chords, after which the texture again loosens up to subsequently present the seemingly scattered material. The end point is C. The second movement (Moderato – Più Allegro) takes recourse to the tradition of the songlike middle movement in which here, however, all kinds of unusual things are mixed together (rhythmic irritations, tonal clashes up to and including clusters). On the other hand, there are also rather "hackneyed" seventh-chord modulations and combination tones that do not disavow their origins in popular music; the tonal center is G. The finale (Allegro) – again in C – begins as a four-voice fugue, which in a tour de force experiences several expositions. Thereby, the jagged theme at times threatens to loose itself in playful-kinetic episodes, but then attains virtuoso forcefulness again. It is not least the final movement, with its sober, neoclassical imprint and a multitude of metrical irregularities, that clearly betrays the influence of Igor Stravinsky. Among the pioneers of new music in Russia, Nikolai Roslavets is one of the most captivating figures. Born on 4 January 1881 to a family of peasants in the Chernigov region of the Ukraine, he learned to play violin early on from an uncle. He later received lessons from a Jewish "wedding fiddler", and learned theory and harmony on his own. From 1902 to 1912 he studied at the Moscow Conservatory, earning diplomas in violin and composition. His early work was initially in late-Romantic style and influenced by French impressionism. A distinctly personal style developed starting in 1913 when Roslavets pushed forward into atonality in his First Violin Sonata – inspired by the daring harmonic innovations of Alexander Scriabin. After the revolution, Roslavets made a name for himself as a champion of (primarily Western) contemporary music. This did not remain without influence on his own works, which he subjected to a novel, strictly constructivist compositional technique. In spite of this he felt himself obliged to the classical tradition, which he vehemently defended against unjustified attacks from the Russian Association of Proletarian Musicians. In his capacity as a staunch Marxist – although he was at no time a member of the party – he believed in the (direct) social benefit of compositional progress, and advocated this position in numerous articles and various administrative functions. In the increasingly difficult environment of the late 1920s, he was then accused of "anti-proletarianism" and "connections to Trotzki's successors". He lost his positions and went in 1931 to Taschkent, where he was active as a conductor and composer at the Uzbek National Theater. In 1933 he was allowed to return to Moscow, and kept his head above water with various teaching jobs and sporadic work for the radio. He died in Moscow in 1944, completely forgotten. Roslavets was the creator of a constructivist system of composition that transcended traditional major-minor tonality. About this system, the composer remarked: "My musical thinking at that time  was concerned with independently feeling out complete musical complexes, a sort of 'synthetic chord', out of which which the harmonic plan of the work was then to develop itself. Within the complete plan of the composition, these 'synthetic chords', which contained six to eight tones... were obviously intended to play not only an external role as tone color, but also the internal role of a substitute for tonality." This results in a strictly regimented structure that is (almost) determined down to the last note: A certain complex of tones is continually transposed, whereby the order of the transposition intervals as well as the details of the harmonic and melodic formations are (relatively) free. Roslavets' music is soberly calculated, but finds its way stylistically to an artistic contrafactum through its natural-organic gesture – breaks or even cuts are avoided, everything seems compositionally worked out and harmonically rounded off. The rational consideration or mechanics of this music is turned inward, as it were, does not appear on the outside. This also applies to the Second Piano Sonata of 1916, a work that was neither finished nor authorized by the composer himself, but was found in his estate and published only in the 1990s. As in Mossolov's Fourth Sonata, it is a one-movement sonata, in the tradition of Scriabin, in which the "classical" formal stations (exposition, development, recapitulation) are emulated almost schematically. But in listening to it, hardly any of this is to be perceived: wavelike-organic progressions and opulent-resonant sound help just as imperceptibly as elegantly to overcome this. The Polish-Jewish composer and pianist Władysław Szpilman was born on 5 December 1911 at Sosnowiec (near Katowice), Poland. After attending Warsaw's Chopin Music School, he studied piano (with Leonid Kreutzer and Arthur Schnabel) and composition (with Franz Schreker) at the Berlin Academy of the Arts. When the National Socialists came to power in 1933, he went back to his home country. He was the only member of his family to survive the Warsaw ghetto. Szpilman gave an account of this in his impressive book The Pianist: The Extraordinary True Story of One Man's Survival in Warsaw, 1939–1945, upon which Roman Polanski based his prize-winning movie The Pianist. After the war, Szpilman was active in an administrative position at the Polish Radio. With the violinist Bronislaw Gimpel, whom he knew from the time of his studies, he maintained a close working relationship that was to result in the 1960s in the establishment of the Warsaw Piano Quintet. Szpilman died in Warsaw on 6 July 2000 at the age of eighty-eight. Szpilman's music clearly followed the popular tendencies of the 1920s and 30s. Thus, he mixed the serious and the popular, took up jazz influences, and understood how to express himself ambiguously and with ironic distance. Szpilman did not just make a name for himself with so-called classical music, but also with music for radio plays and movies, children's songs, and ca. five hundred pop songs. In 1961 he founded a pop song festival that still takes place every year in Sopot. The piano suite The Life of the Machines (1934) is ostensibly informed by all sorts of etude-like kinetic energy, which is however always kept witty, relaxed , and elegant. The first movement, without tempo indication ("Langsam anfangen" / "Starting slowly"), plays with tone and chord repetitions out of which songlike contours gradually emerge. Dissonances of seconds as well as transparent layers of fourths and sevenths dominate in the tonal image. The Andante middle movement ("Maschinen im Ruhezustand" / "Machines in an Idle State") offers a delicate-bitter cantilena accompanied by modally colored supporting chords; the mechanical is joined here somewhat subliminally by folklore (mazurka rhythm). The finale ("Toccatina", Allegro ritmico) builds a bridge back to the beginning, whereby the playful-virtuoso element is allowed to develop more exuberantly. Recognizable as models, both in pianistic as well as compositional-technical terms, are Sergei Prokofiev and the French impressionists (Debussy, Ravel). Not strenuous stamping, but impressionistic sensitiveness mark these original images of machines. At the same time, these are more than just loosely strung together genre pieces ("suite"); the order and character of the movements entirely justify the title "Sonatina". Many progressive Russian artists put great hopes on the October revolution of 1917. They were filled with enthusiasm for the utopian goals of the Soviets, and hoped that they could place their new, experimental means of expression at the service of "social progress". A fusion of the artistic and political avant-garde seemed attainable. Disillusionment followed rather quickly however. Already by the end of the 1920s, creative independence that deserved this name was unwanted and suspicious. Not a few artists experienced reprimands, restrictions of elementary civil liberties, and even imprisonment. The composer Alexander Mossolov is a prime example for this tragic development. Born in Kiev on 11 August 1900, Alexander Mossolov grew up in Moscow in a middle-class environment. In 1918 he joined the Red Army as a volunteer and fought against the White Army. After being wounded and working for a time as a pianist for silent movies, Mossolov studied piano and composition (with Reinhold Glière and Nikolay Myaskovsky) at the Moscow Conservatory from 1922 to 1925. By 1928 he had written some thirty works – including a chamber opera (The Hero), a symphony, a string quartet, vocal cycles, piano music, and a piano concerto – with which he made a name for himself as one of Russia's most progressive "leftist" composers. His orchestral work The Iron Foundry (1928), a "machine music" modeled on Arthur Honegger's Pacific 231, caused a sensation and was also championed by prominent conductors in the West. The year 1928 was the turning point in Mossolov's creative biography: Works slated to be performed (including a new opera The Dam) were removed from the schedule at the behest of the highest authority, and the press began to speak disparagingly of his music. In 1932, still hoping for an improvement in the situation, Mossolov wrote a letter to Stalin in which he complained that performances and publications of his works were becoming increasingly less frequent. Yet, times had changed, and the "avant-garde" oriented on Western models no longer found favor. In 1936, Mossolov was expelled from the composers association under a pretext, and accused in 1938 of being a "counterrevolutionary" and sentenced to eight years of labor camp. To be sure, the imprisonment was reduced to a year thanks to the intervention of his former teachers Glière and Myaskovsky, yet Mossolov was not allowed to dwell in Moscow, Leningrad, or Kiev until 1942. Starting in the late 1930s, Mossolov adapted himself to the official expectations: he henceforth wrote in an unspectacular, "conservative" idiom that was praised by the critics as "socialistic realism with a smattering of impressionism". Mossolov died in 1973 after protracted illness, unnoticed by the musical public. With the success of The Iron Foundry, a success that extended beyond the borders of Russia, the impression could arise that Mossolov's artistic interests were one-sidedly oriented on the world of machines and technology. Parallel to this, however, there is a markedly lyrical vein that is obliged to late-Romantic, solemn inflections, especially those of Alexander Scriabin, who was more or less the model for all Russian composers of the generation born between 1880 and 1905. Thus, the Piano Sonata No. 4 op. 11 (1925) is also clearly related to late Scriabin, both in terms of its advanced tonal technique as well as form (as a one-movement sonata). But in contrast to Scriabin, one encounters here numerous abrupt changes of tempo and expression, an almost kaleidoscope-like "jumble" of ideas, which appears to preclude an organic arc of development – and it is exactly here that Mossolov's personal style shows itself. Behind it, however, stands an almost "classically" constructed sonata-allegro form with clearly fashioned themes. Although the volatile nature of the development might seem a bit capricious, it is the guarantee of a never-abating tension between kinetic-frothing and lyrical sections – a tension that additionally gains greatly through the pianistically highly sophisticated style (that even won the respect of Sergei Prokofiev). The end of the First World War marked one of the low junctures of European culture. The ideal of a self-sufficient, "absolute" music was shaken to the core. Many composers began to seek shelter in popular and functional music, but also, among other things, to bridge the gap that had opened between new music and the horizon of expectation of the public at large. Stylistically, the 1920s do not represent a cohesive or even uniform period of time in terms of compositional methods and aesthetic ideas: It is a phase of pluralism and experimentation marked by both a radical striving for innovation and the attempt to reclaim the old "classical" values. The American composer George Antheil (born 8 July 1900 in Trenton, New Jersey; died 12 February 1959 in New York) was born to a family of German-speaking immigrants. After piano and composition studies, the latter from 1919 to 1921 with Ernest Bloch in New York, he went to Berlin on a scholarship. He originally aspired to a career as a pianist, but then turned to composition. However, there was little that he could fasten on to: The "mountainous" sentiment of Richard Strauss remained just as foreign to him as the "lecherous" sounds of the French impressionists (Debussy, Ravel). Antheil found his own style in a decidedly rhythmically determined and jazz-inspired music that particularly rendered homage to the sphere of technology and machines. The titles of early works, exclusively piano compositions, are program: Airplane Sonata, Death of Machines or Mechanisms. Death of Machines (1922) consists of a series of four short "movements" that follow one another without a break; they are grouped together under the title Sonatina, which was meant ironically. The machinelike-precise motion of the opening (Moderato) begins to stumble immediately. The second movement (Accelerando) again takes up the original motion, but in turn loses itself in ragged gestures. Analogous to these are the two tonally more compact final movements (both: Accelerando); they, too, increase in speed to then slump down again. The conclusion is formed by a quotation from the opening, which is followed by the abrupt end: the machine crashes with a glissando, a last protest – and finis. It is noteworthy that the technology is not heroized, but depicted as vulnerable – it is not man who adapts to the machine, but the machine that follows human standards, i.e., is finite and transient. In 1923, Antheil moved to Paris, where he enjoyed friendly relationships with the leading artists of the time – with Eric Satie, Jean Cocteau, Ernest Hemingway, James Joyce, Ezra Pound, and Pablo Picasso. Concert tours led him throughout Europe. He long remained attached to the idea of an artistic relationship to the world of machines and technology; this reached its high point in the Ballet mécanique of 1926 for sixteen player pianos (i.e., mechanical pianos). Antheil subsequently turned toward Stravinsky's neoclassicism, but he was unable to achieve anything of his own in this idiom. From the 1930s (and after breaking with Stravinsky) Antheil lived mostly in the USA, where he was active as a composer of functional music (primarily for movies) and as a journalist and author. Around 1940, encouraged by the conductor Leopold Stokowski, Antheil again began to write his own music. The works after 1945 are characterized partially by backward-looking "classical" traits, partially by a strange (for European ears) mixture of sweet lyrisms and ironically broken traditional and folk song quotations. It is hardly a coincidence that this is reminiscent of Charles Ives, the "father" of American music, from whom Antheil had learned a great deal. Antheil never disavowed his avant-garde early works of the 1920s: he remained faithful his whole life to the inclination toward "modern" rhythms and glaring dissonances. About the large-scale, three-movement Sonata No. 4 from 1948, the composer wrote: "Aesthetically, the work represents the fusing together of many of the elements of my earlier music... Although I hope that my musical expression has many sides... still, undoubtedly, one of the elements of my expression which is most often commented upon is that it has the iron ring of modern civilization: the sound of this kind of music – which I've expressed as early as my Ballet mécanique in 1932 – may be heard again in the first [Allegro, Giocoso-Ironico], and particularly the last [Allegro, Presto] movements of this sonata. The furious, sometimes gleeful, sometimes horrific march of modern civilization may, I think, be heard in these movements. It has also been pointed out by several most eminent critics, that my music has a strong satirical and ironic sense; in the first movement of this sonata one may hear, if one chooses, a certain gleeful burlesquing of a Chopinesque passage... The middle movement [Andante, Cantabile sostenuto] is conceived as a slow movement to contrast with the two outer movements which are rather aggressive. But it is more than that; it is also the expression of a neo-romanticism which, in this age of steel, I feel to be more and more a part of the dreams and ideals of the world which threatens to become submerged in grim reality. I wanted to endow this movement with a sense of personal tragedy – and romance too. It works out a new sort of lyricism which I hope will be expressive of this sort of humanity, and even tenderness."